Cash for Gold is a team of certified professionals with extensive experience in the in the field of buying jewellery and related products. Assessing gold is not an easy task and we do acknowledge this fact very well. All our staff has undergone robust training by the management professionals and numerous tests before they actually deal with individual customers and find the worth of their assets. At CASH FOR GOLD, , we pay the highest value for your assets all the while educating you the process. We ensure you get the best return on your investments in the form of cash or cheque. Cash for Gold is your one-stop shop solution to sell any of your gold, silver & diamond valuables and get cash instantly. We do on the spot analysis of your products and make on the spot payment as well. When your priority is getting extra cash for your liquidity, CASH FOR GOLD has a solution to meet your requirements. Cash for Gold provides the below listed services – 1) Cash for Gold 2) Cash for Silver 3) Cash for Diamonds 4) Valuation of Gold and Silver and Diamonds Why Us Cash for Gold is the first & No 1 trusted leader in the concept of Cash against Gold in India. It is a professionally managed company with more than five decades of experience, reputation, trust, honesty and reliability. We have fixed policies which makes sure that all our customers are treated equally and the best & fair value is provided for their gold, silver or diamond assets.Our professionalism will provide you ultimate peace of mind and a reason to smile. CASH FOR GOLD, follows a standardized and technology based testing process to value your gold silver & diamond assets, which allow CASH FOR GOLD to give the most accurate value to its customers. When you are selling your gold or silver valuables, we have got you covered and our certified Gold and Silver experts are always ready to help. We not only buy gold and silver but also diamonds which is rarely bought by anyone else in the market. CASH FOR GOLD pays the highest possible value based on the current live rate for your gold or silver assets. In today’s scenario where gold loan companies give minimal value for your gold and charge huge interest, a lot of customers prefer opting cash for gold option. With Cash for Gold coming into existence, people are relieved by not putting their gold under loans and paying high interests over a long period of time. . At CASH FOR GOLD , we treat our every client with the zeal to establish a long term and mutually beneficial relationship. While others are quick to jump on the gold and silver bandwagon, our experts here at CASH FOR GOLD have already been doing this for decades, and we have carved out our place among the best of the best in this industry.We are proud of doing our business honestly, fairly and transparently. We treat all our customers with due respect. If you intend to sell your gold, silver or diamond, please give us a call or visit us at our outlet. For your convenience, we are open 6 days a week. . CASH FOR GOLD is truly committed and honest to its customers and provides the best value for their unwanted or unused assets. Benefit for Customers: More than five decades of legacy and experience Testing of Gold through the latest technology available. 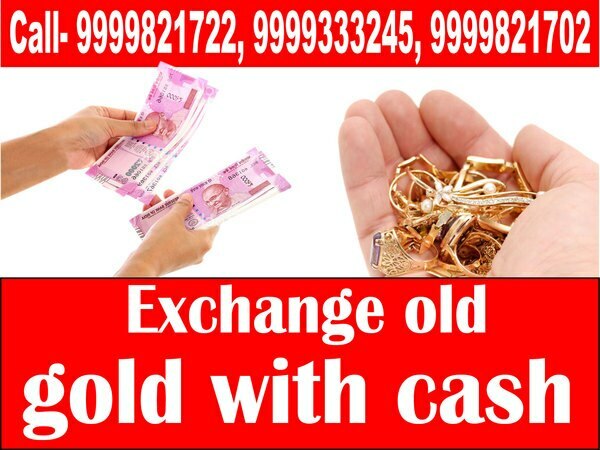 CASH FOR GOLD uses the cutting edge latest technology, KARATMETER, to value the gold Outlets spread all over Delhi and NCR so that you can visit theone nearest to you Fully Trained & Experienced experts to serve the customers 100% Honesty and Transparency No 1 trusted gold buyers which guarantee highest payout of cash Cheque/NEFT/RTGS facility also available Few of the articles that CASH FOR GOLD will buy are Gold Rings, Bracelets, Necklaces, Ear Rings, Bangles & other Gold Jewellery Gold Biscuits Gold & Silver Coins Silver Jewellery and Silverware All other silver articles Our Brand VISION Cash for Gold wants to be the most trusted, preferred and reputed Group in North India by 2020, offering the best value to its customers through its various lines of businesses. MISSION Our mission is to provide our customers the best value for their unwanted or unusable assets. We plan to do this through exchanging their (un)usable assets like silver, gold and diamond jewellery into more usable assets like cash. We want to provide our customers with an inviting experience at our outlets by delivering superior value, quality and customer service, and helping them turn their dreams into reality. We believe that all customers deserve to know the value of their jewellery, coins, bars, gold, silver and gemstones before making the commitment to sell. Through a technical and transparent valuation process, we aim at providing our customers with greater return on their investments, much higher than what's being offered by other gold buyers or jewellers in the market. PHILOSOPHY Our Philosophy is to deliver incremental value to our external stakeholders by giving them an opportunity to recycle their existing and (un)usable assets like gold, silver and diamonds into more usable and high value assets like Cash.